Rome (Italian Roma) is the capital of Italy and of its region, called Latium. It is located across the confluence of the Tiber and Aniene rivers. It was once the capital of the Roman Empire, the most powerful, largest and longest lasting empire of classical Western civilization. 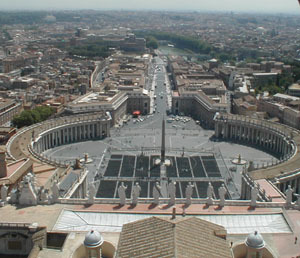 The Vatican, a sovereign enclave within Rome, is the seat of the Roman Catholic Church and the home of the Pope. The civilization of ancient Rome originated in the 8th or 9th century BC, when the tribe of the Latini migrated to the Italian peninsula to settle around the River Tiber. For almost a thousand years, Rome was a very important city in the Western world and possibly the largest city in the world, with around 1.5 to 2 million inhabitants, as the capital of the expansive Roman Empire. With the rise of Christianity, Rome became the center of the Roman Catholic Church and the home of the popes. The slow decline of the Roman Empire heralded the beginning of the Middle Ages, but the city regained prominence as the cultural capital of Western Roman Empire for several hundred years leading up to the Renaissance. 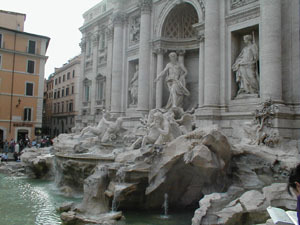 Rome remains influential today, as the capital of Italy, as center of the Catholic Church, and as a major metropolis. The name Vatican is ancient and predates Christianity, coming from the Latin Mons Vaticanus, Vatican Hill. It is part of the Mons Vaticanus, and of the adjacent former Vatican Fields where St. Peter's Basilica, the Apostolic Palace, the Sistine Chapel, and museums were built, along with various other buildings. The area until 1929 was part of the Roman rione of Borgo. Being separated from the city and on the west bank of the Tiber river, it was an outcrop of the city that was protected by being included within the walls of Leo IV. When Lateran Pacts of 1929 that gave the state its present form were being prepared, the fact that a good part of the proposed territory was all but enclosed by this loop led to the present territorial definition being adopted. For some tracts of the frontier there was no wall, but the line of certain buildings supplied part of the boundary, and for a small part of the frontier a modern wall was constructed. The territory included St. Peter's Square, which was not possible to isolate from the rest of Rome, and therefore a largely imaginary border with Italy runs along the outer limit of the square where it touches on Piazza Pio XII and Via Paolo VI. St. Peter's Square is reached through the Via della Conciliazione connecting it with Rome via the Ponte Sant Angelo.